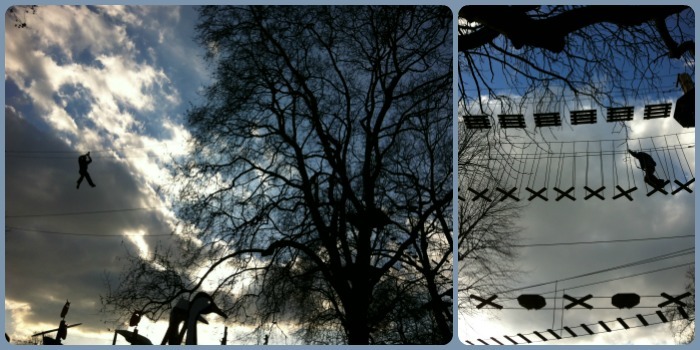 Last week we took a drive down to London to Battersea Park. Mr MoaB was going to do the Go Ape course, which only opened earlier this year, with some of his work colleagues. I took the day off work so that he could take part and Little Miss A and I went along for the ride and to explore the Park. After battling with the London traffic (so glad Mr MoaB was driving and not me! ), we got to the Park around lunchtime. We were starving so decided to have lunch in the Putt in the Park Cafe which serves wood-fired pizzas. These definitely set us up for the rest of the day. There was then just time for Daddy to have a bit of a play with Little Miss A in the children's playground before he needed to go off to be briefed for his Go Ape session. Little Miss A and I played for a bit longer and then we went for a bit of a wander. The Park isn't that big so we covered quite a lot of it including the Sub Tropical Gardens, the Peace Pagoda and we stopped by the River for a bit to take in some of the sights. There is a Zoo at the Park and if we'd had a bit more time, I would have taken Little Miss A there but instead we headed back to playground and to see how Mr MoaB was doing. It was really handy that the Go Ape course has been built directly over the playground, so we could play and watch him! I really would have loved to have been up there on the course with him. I think Little Miss A would have too! She's not far off being tall enough to try the Junior course which she's going to love as she's such a thrill seeker! Mr MoaB thoroughly enjoyed the course - it was much more challenging than he thought it would be (and he's done 18 Go Ape courses!). We were so lucky with the weather - it was one of those rare sunny winter's days. Just right for exploring the Park. It was a nice day out although if we went there again I think we'd take the train into London rather than drive! That's a fab idea by Go Ape to have built their ropes over the playground. It looks like such a great play area, too. Is that crane (bird) part of the playground or somewhere else in the park? 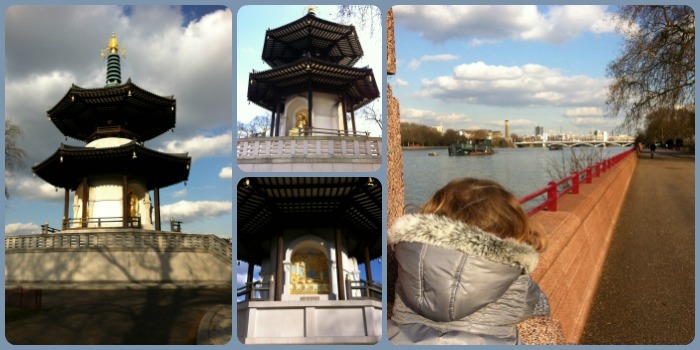 Battersea Park looks like a great place for #daysoutwithatoddler - a zoo, too?! Wow! Thanks so much for linking - see you next month! 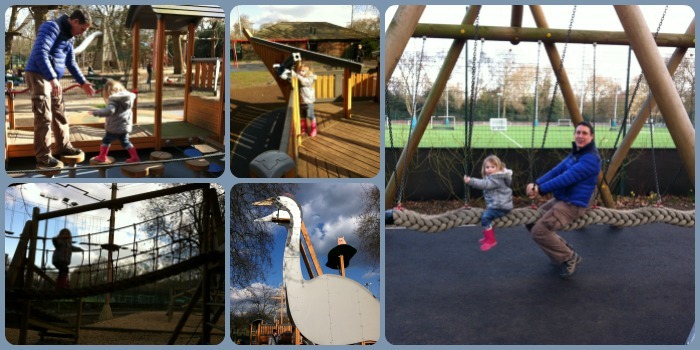 It is a great park and very family orientated. I'd like to visit the zoo sometime. The crane is part of the playground - a bit random but quite cool!